APRIL 2019, HIGH POINT, NC – Presented with simple lines, understated carving and metal accents, the Majorca Collection by Marge Carson is a blending of design influences from France, Italy and Spain that creates an inviting and casual traditional look. The collection is named for Majorca, a beautiful romantic island off the coast of Spain with stone villages, wineries, citrus plantations and steep, stunning mountains beside the iridescent blue Mediterranean Sea. 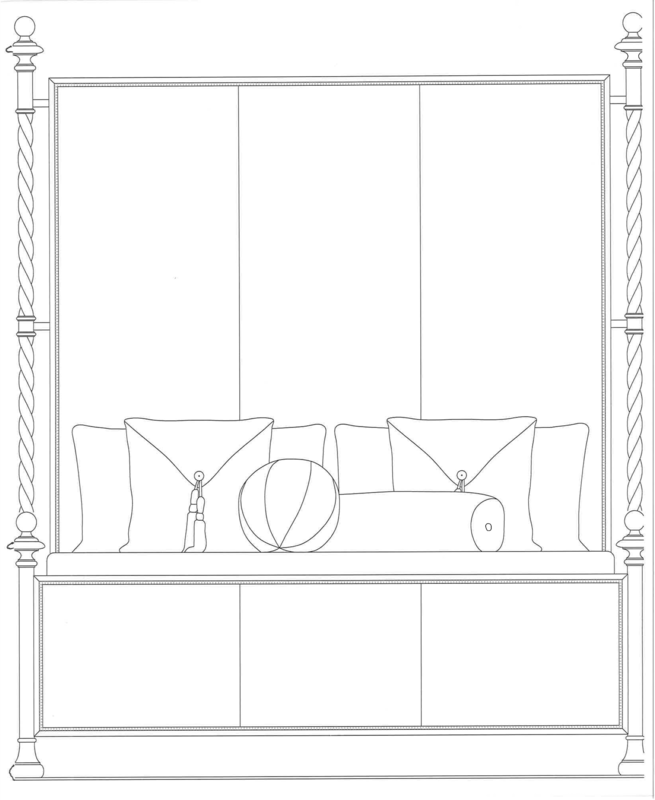 An abundance of scrolled and rope-twisted metal work on the occasional pieces and statement beds and a bench are reminiscent of the garden gates prominent throughout the landscapes of Southern Europe. 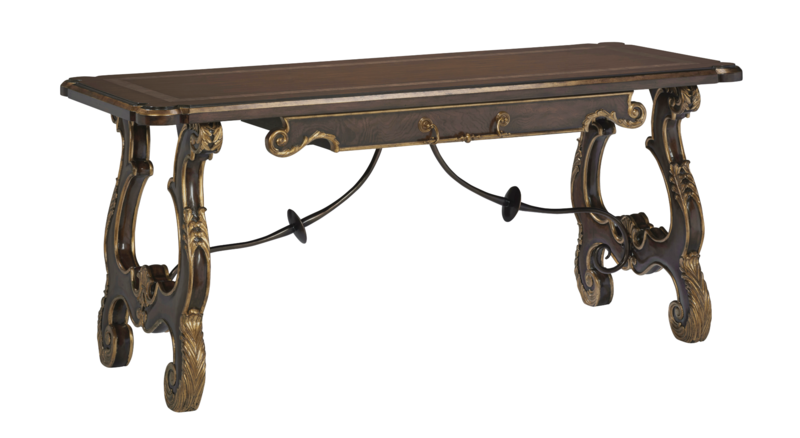 The ironwork on occasional table legs and bases, bed posts and a spectacular panel headboard gives an eclectic, updated Tuscan and Old World ambience to the collection. “Majorca presents the casual traditional style so many designers and consumers are looking for,” said Jim LaBarge, chief executive officer of Marge Carson. “It is beautiful and distinctive furniture, yet it’s inviting and not overly fussy or formal,” he said. Crafted of Cathedral White Ash, Burl and Walnut, decorative inlays provide intrigue and contrast. Hand-planed surfaces are offered on the round dining table tops in an interlocking veneer pattern, and on the top of the dining credenza, providing rustic sophistication and tactile interest. 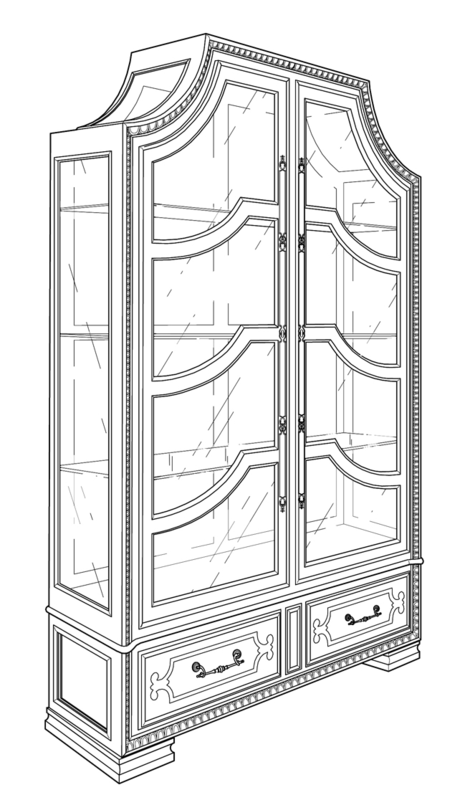 30 pieces, including bedroom, dining room and occasional. Formal Traditional: The rich, medium brown, lightly-distressed Havana finish is combined with accent leaf trims in aged silver, bronze silver and silver cloud for a touch of glam. Old World Drama: A bold contrast, pairing the high-sheen Ebony finish with heavily gilded gold accents and leafing. Casual Traditional: Majorca is interpreted in lighter, drier, lower-sheen finishes in cream, gray and taupe tones such as Malt and Dapple, reminiscent of a birch-log color palette. Dark Bay, Sandalwood and Pumice play in the ash gray to cocoa brown tones with some light burnishing. Subtle leafing in antique silver and lighter champagne tones add soft elegance. The dramatic, two-tone, custom-designed hardware includes ring pulls and key pulls, and combines antique nickel and antique brass. Simple lines, understated carving and an abundance of metal accents on the occasional pieces and statement beds make Majorca a casual, easy-to-live-with collection that fits into a diversity of decors and lifestyles. While casual and relaxed, the collection is romantic and sophisticated, inspired by French, Italian and Mediterranean design influences. 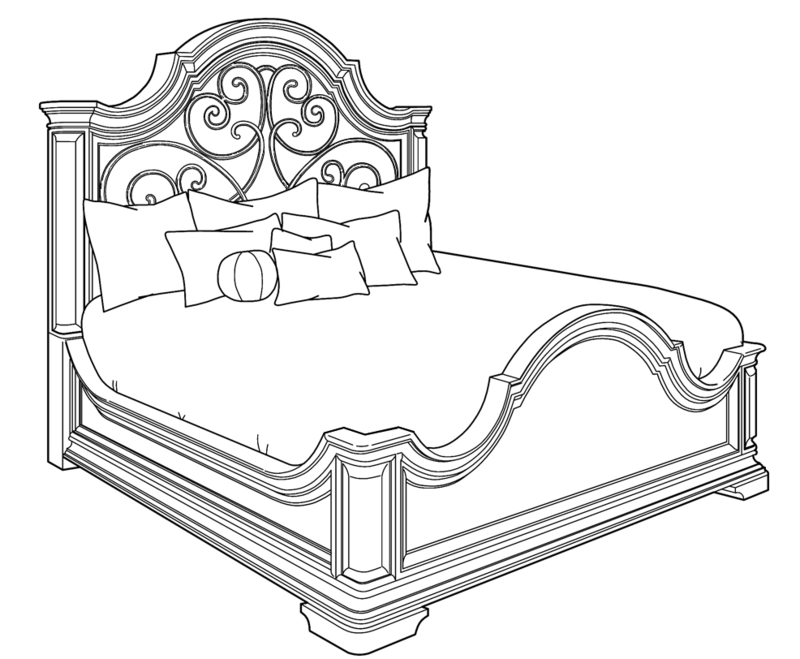 One of two statement beds in the collection, this dramatic silhouette features 2 metal rope-twist posts and a 102-inch high upholstered headboard with nailhead trim. The arch-shaped headboard of this exquisite bed is adorned with a stunning scrolled decorative overlay in a metallic finish that is reminiscent of garden gates throughout Southern Europe. This 105-inch high focal-point piece has the appearance of an imposing iron gate or set of doors leading into a stately building. The clipped corners at the top have a distinct Mediterranean flavor. 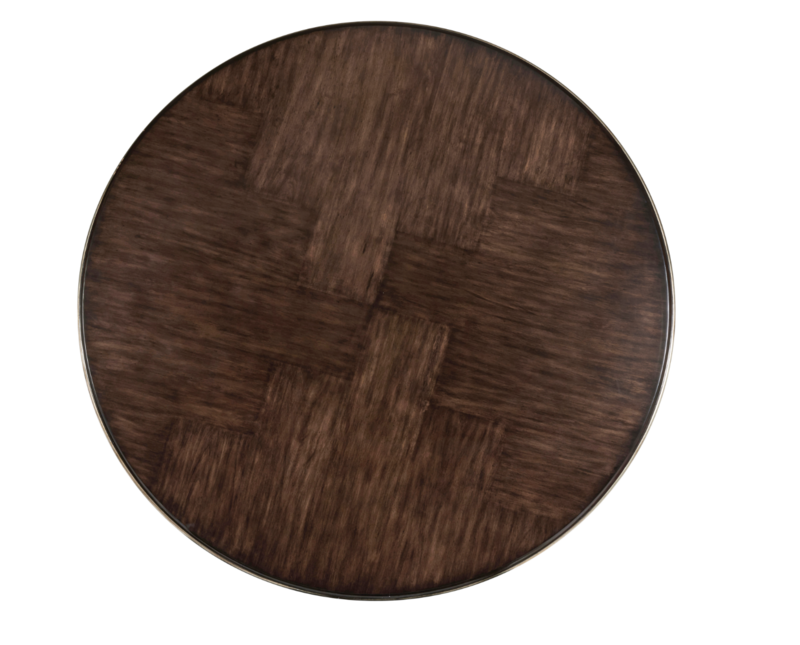 Both the 54-inch and 72-inch round dining tabletops feature a hand-planed top surface with an interlocking motif to emulate a plank floor that might be found in Southern Europe. The shaped and carved wooden legs of the table base are influenced by Italian and classical design. 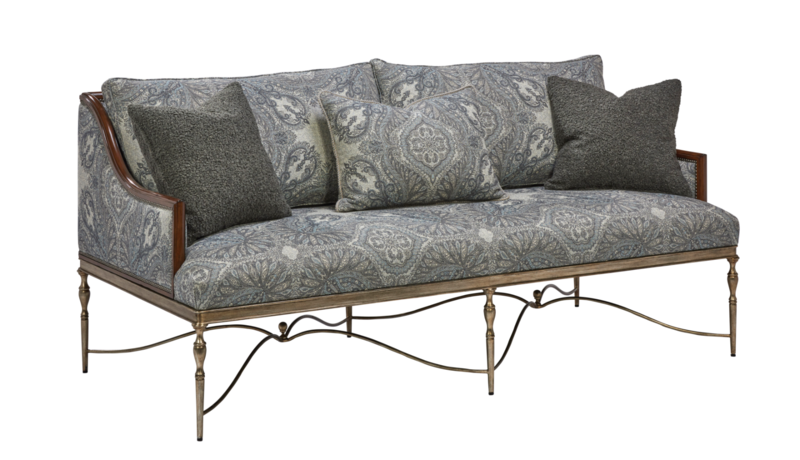 Moderate in scale and with a delicately-scrolled metal base, this 80-inch wide upholstered sofa feels like an antique you might find in an old Spanish castle.  It’s presented in a blue, white and gray color story in an oversized tile pattern with a Moorish flavor. Accent pillows provide a canvas for drama and color, making this an excellent piece for an entry foyer, at the foot of a King-sized bed, in front of a fireplace or used in pairs. 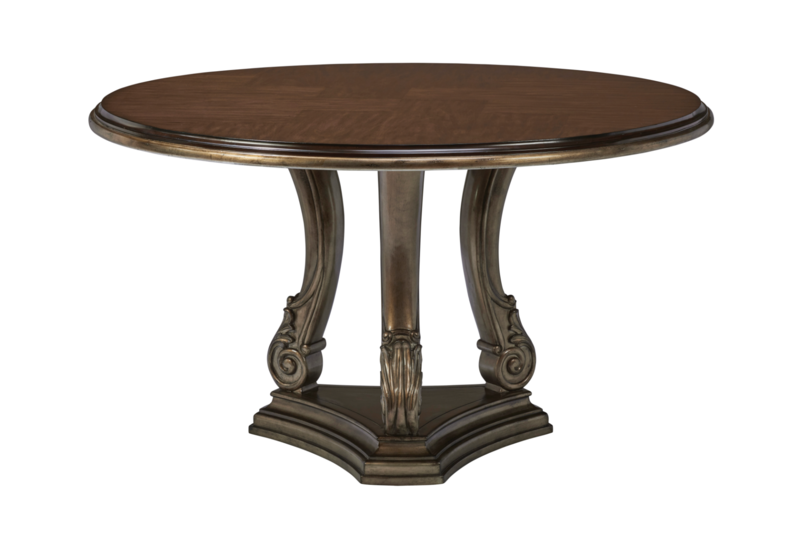 This versatile piece crafted in Cathedral Alder and Quartered Walnut features a decorative, scrolled metal stretcher in the base area. 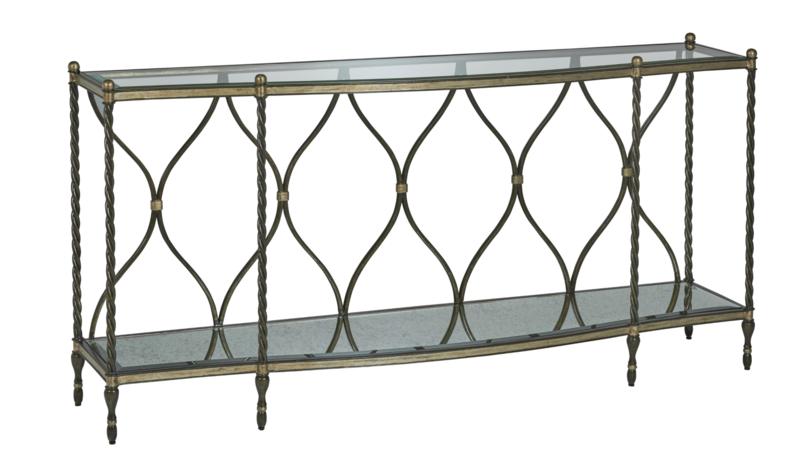 Epitomizing an Old World European flavor, but with updated scale, this shaped metal console combines rope-twisted legs topped by decorative finials with a base designed in teardrop-shaped motifs, finished in Aged Metal and trimmed in Aged Medici.